New 3KW rated wind generator up. Wind does it in. 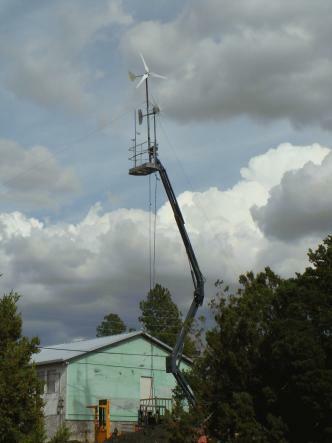 We got a wind generator direct from China that is rated 3KW in a 28 mph wind. It arrived OK in about 2 weeks from ordering. Unfortunately, the packaged included two matched blades and one not matched. This means that the mounting hole for one of the blades had to be enlarged to get it to mount and then we were not able to get the tips to position evenly or balance. The result is that the tail vibrates vigorously once the wind gets to about 20 mph. The supplier indicated they would send replacement blades but they have not done that to date. The tail flops around (back and forth in its slot) causing the blades to frequently not fully face the wind. We assume this moving tail is supposed to turn the blades away from the wind when the wind exceeds 55 mph but we have yet to see that happen. We also have yet to record data at 28 mph or more so we don't know if it actually produces what was advertised. Very initial manual readings at relatively lower wind speed indicated that this 3 blade wind generator will come closer to performing as advertised than the 1500 watt 11 blade unit we first put up. The 11 blades look impressive but in fact the actual RPM is much lower for a given wind speed than the 3 blade turns. After a relatively short time up, and surviving some really strong wind, a gust recorded around 55 mph collapsed the 4" tube of the mast holding the generator up. The spinning blades encountered guy-wires or structure on the way down and messed up the blades. New blades were ordered and arrived from China but there never was time to get it back up in the air. Maybe this winter. This page contains a single entry by Cavlon News published on April 10, 2012 4:50 PM. Finally back to blog was the previous entry in this blog. soon to be listed for sale Really Cool Nuclear Security Pursuit Van is the next entry in this blog.